HTC and Valve have partnered to create the HTC Vive virtual reality system. The Vive features room-scale tracking and includes motion controllers bundled with the headset. Designing your game or experience for a specific input device is essential for a VR developer so having the motion controllers come with every Vive is a very important advantage for this platform. With the power and popularity of Steam, the strength of its Lighthouse tracking technology and the bundling of motion controllers, the Vive is sure to achieve a wide market appeal to consumers. In this free mini course you will learn the basics of how to create room scale and seated VR experiences with the HTC Vive, SteamVR and Unity. 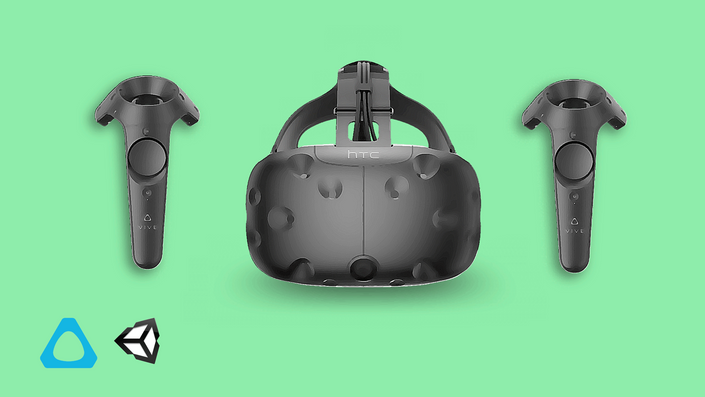 This mini course is designed to give you a quick win with HTC Vive development. The goal is to get you up and running with Vive VR development as quickly as possible. I will take you through the basics of setting up your development environment and we'll explore some of the code included in the Steam VR Unity plugin. We'll take a look at receiving input events from the Vive controllers and using those events to interact with objects in the virtual world.